In the decades during and immediately after the search for Franklin and the discovery of the final record at Victory Point, there were many who gave public lectures on what was known -- or unknown -- about the fate of Franklin. The speakers included many leading lights of the day, among them: William Scoresby, Leicester Silk Buckingham, Charles Francis Hall, and William Bradford. 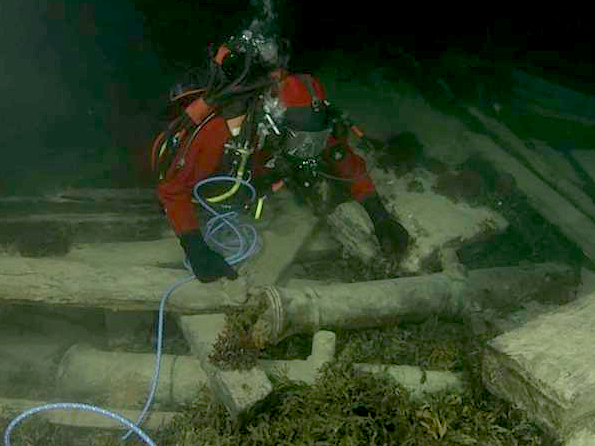 Yet none ever spoke from a platform as rich and resonant with history as that occupied by Parks Canada archaeologist Ryan Harris today: the deck of Sir John Franklin's long-lost flagship, HMS "Erebus." There, whether showing viewers the six-pounder cannon, the propellor well, or the double-action Massey bilge-pump, Harris was at and upon the very vessel of his subject, with no need to employ magic lantern slides, panoramas, or PowerPoint presentations to make his gestures real. It's no easy matter giving a talk while diving, but Harris, I think, managed it with aplomb; there has never been a stronger sense of vivid, actual presence, here on the very boards where Franklin and his officers and men once strode. That said, there are still depths at hand that this video left unplumbed -- what of the Fraser stove, sighted on last fall's dive, and apparently still in situ; what of the ship's engine, which may have much to tell us about whether it was employed to speed the vessel forward in case of calms; and what of any artifacts, whether deep aboard or scattered in the débris field? One has the sense that, just perhaps, there have been some other finds on this series of dives, finds whose full disclosure and significance will have to wait until the Parks Canada and Canadian Naval teams return from their Arctic sojourn. And so all of us who feel a passionate interest in this great Canadian historical mystery now wait, with bated breath, for such news. The part which stood out to me was the skylight....oh how I wanted to see that "popped" off and for him to peer inside! While we get to watch and be fascinated by it all, it also comes through clearly that those actually doing the work as sensing just how special this assignment is. This is not just another job for them, they are relishing their roles in this enterprise. Who among us wouldn't want to trade places with them! I had the same thought about the skylight. And, while they didn't need to show us what was through it could they at least have told us if they saw distinct objects or just a pile of debris and silt? The former could mean a quicker discovery of artifacts while the latter would suggest a much longer and tougher archeological "dig". I'm going to have to review my Franklin books again. The thought that the ship may have sunk because no one was alive to use the bilge pump appears to be a simple explanation. Perhaps the "big dead man" with the long teeth was the last sailor alive on the boat and when he stopped using the pump that was it. 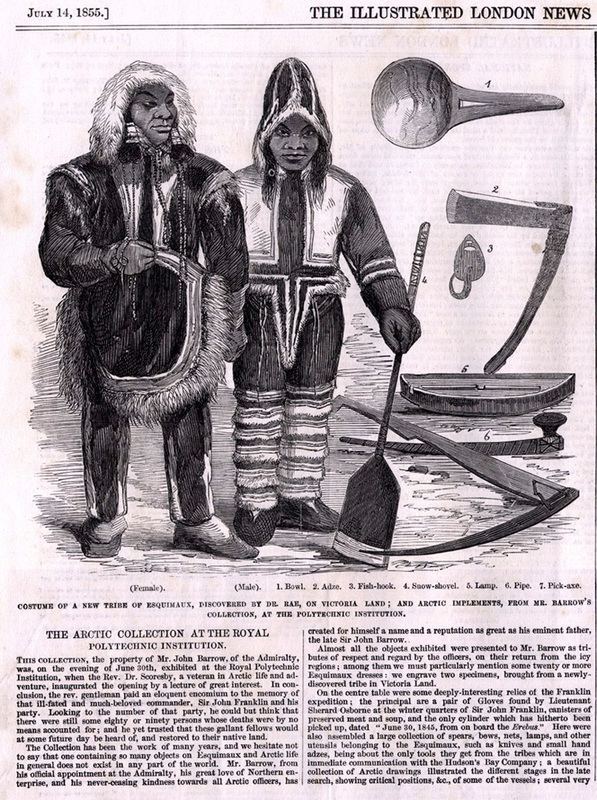 I always thought it was the ice that did it, with perhaps a little help from the Inuit attempting to gain entry. It has been really fascinating. Never the previous advertisement to a video seemed to me so long. Those have been the more dramatic 9 minutes of lecture I have witnessed in my live. Interesting that neither the propeller nor the wooden chocks intended to fill the space between the stern post and rudder post are in place. I'll be very interested to know where they are, and whether the rudder is fitted or stowed.